Happy Valentine’s Day! I hope everyone is doing something fun, whether it’s hanging out with friends, spending time with family or having a cozy little evening with the one you love. Last year on Valentine’s Day we told our family we were expecting, this year we have an adorable little 5 month old to celebrate today with. Instead of going out to dinner this year we’re planning on dining in and keeping things really relaxed. Our week has been pretty stressful and since we’re both getting over colds a night at home seems fitting. 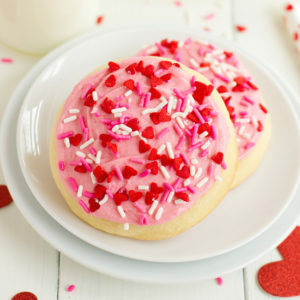 For dessert we’ll be eating these bakery style sugar cookies. They may not seem fancy but boy are they good! 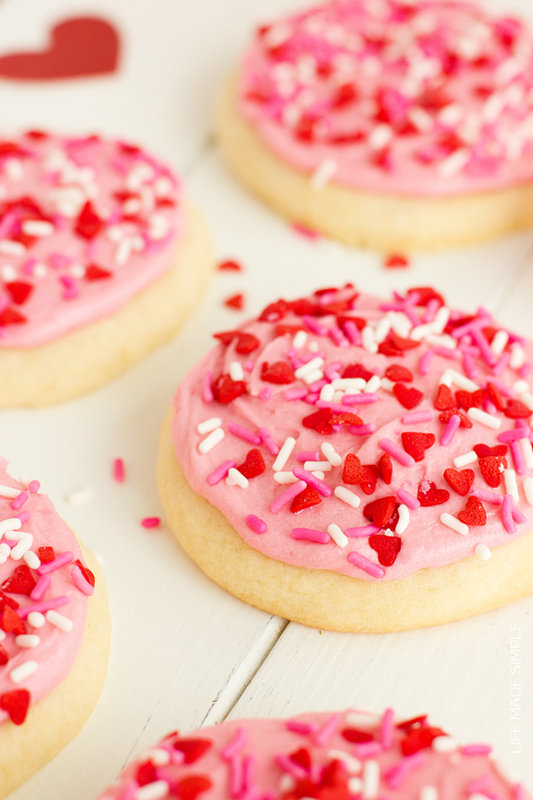 Have you ever tried a Lofthouse cookie, or Grandma B’s? Yep, these taste just like those, only better! 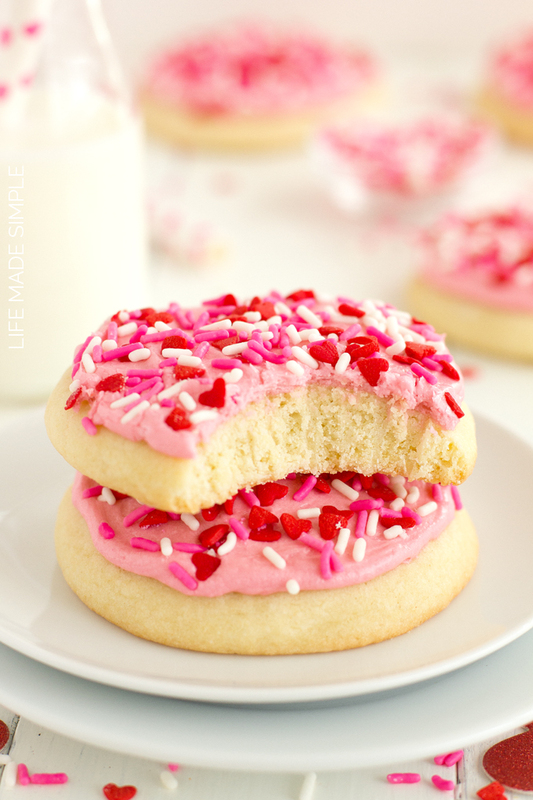 I’ve always been a huge fan of sugar cookies, especially soft ones that are covered in fluffy buttercream and covered in sprinkles. Not having to roll and cut them out is an even bigger plus in my book. That’s why these cookies are so great! To start off you want to cream the butter and shortening together. Getting it nice and creamy will help the texture of your cookie stay nice and soft, it will also help give it added lift since you are beating in air while mixing. Vanilla extract and almond extract are used to create that sweet bakery taste (along with the cream of tartar), only without all of those preservatives. Don’t opt out on the almond extract or you’ll be disappointed! The addition of an extra egg white also helps to keep the crumb of the cookie light and adds a crispness to the outside edges. I decided to use a combination of cake flour and all-purpose flour. That way the cookies aren’t too dense but they still hold their shape well while baking. Because the dough for these cookies is very soft and moist, I recommend chilling it for at least 3 hours. Not only will that help with shaping the cookies, but it helps the ingredients meld to together giving these better flavor and the ability to bake better. Once your dough is chilled take it out of the refrigerator, lightly flour a surface and start scooping giant balls of dough. When I say giant I do mean giant. These are jumbo bakery style cookies! 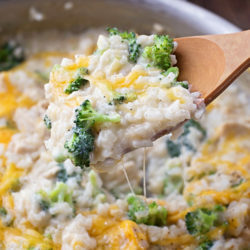 You’ll want to make each about 3 – 3½ tablespoons in size. I love my #20 scoop for this! Roll them in your hands to create smooth ball and then roll them into the flour so that it’s lightly covering the entire cookie. Using the bottom of a measuring cup, smash each ball down to ½ inch thick. They should be about 2- 2½ inches in diameter. Place six cookies on a prepared sheet (remember these spread a lot) and bake them. While they are cooling prepare the buttercream and spread over the cooled cookies. 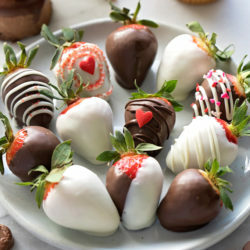 Make sure you have someone to give a few of these to or you might be tempted to eat all of them! Enjoy!!! 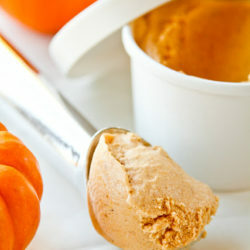 Using a large cookie scoop (#20- approximately 3½ tbsp. ), create balls of dough, lightly roll on a floured surface so that it covers the ball of dough completely. Press each ball of dough flat so that it is ½" thick and about 2½ wide. Place 6 cookies onto each prepared baking sheet. Place in oven and bake for 10-12 minutes (the cookies will still look soft in the centers, do not over bake) or until the cookies become firm on the edges. Remove and allow to cool for 3 minutes before transferring to a wire rack to cool completely. Meanwhile, to make the frosting, in the bowl of a stand mixer fitted with the whisk attachment, cream butter until it becomes light and smooth. Add salt, food coloring and 2 tablespoons of milk. With mixing speed on low gradually add powdered sugar. Once powdered sugar is incorporated, bring mixing speed up to high and beat for 2 minutes. Add more milk to reach the desired consistency. 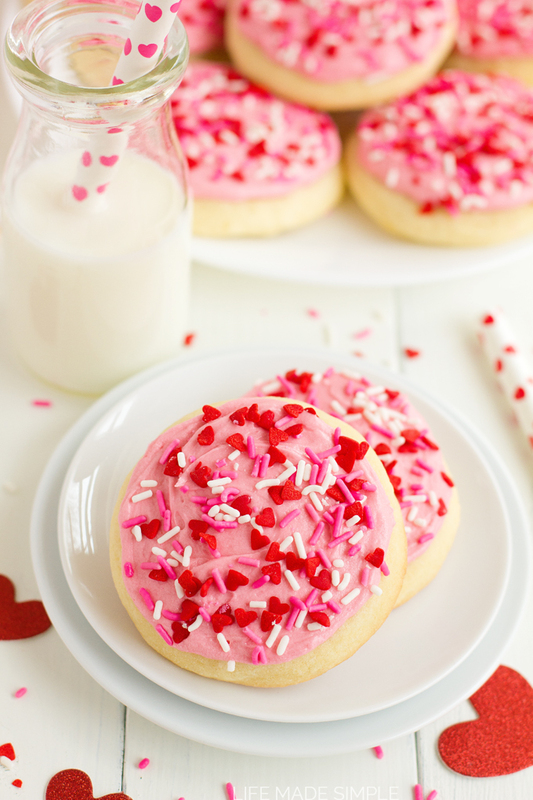 Frost onto cooled cookies and top with sprinkles. Oh Natalie, these turned out so beautifully, pinned! Can these be made into cut outs? Yes, roll the dough out to 1/2″ thick. Shapes with less detail are better, since these do puff and spread a bit. Enjoy!